Family is an amazing blessing and no one knows that better than this sweet family I recently had the pleasure of photographing. It was a fun mixture of relations and personalities. Giggles were a big part of this session and the sweet little faces responsible for them couldn't have been cuter. 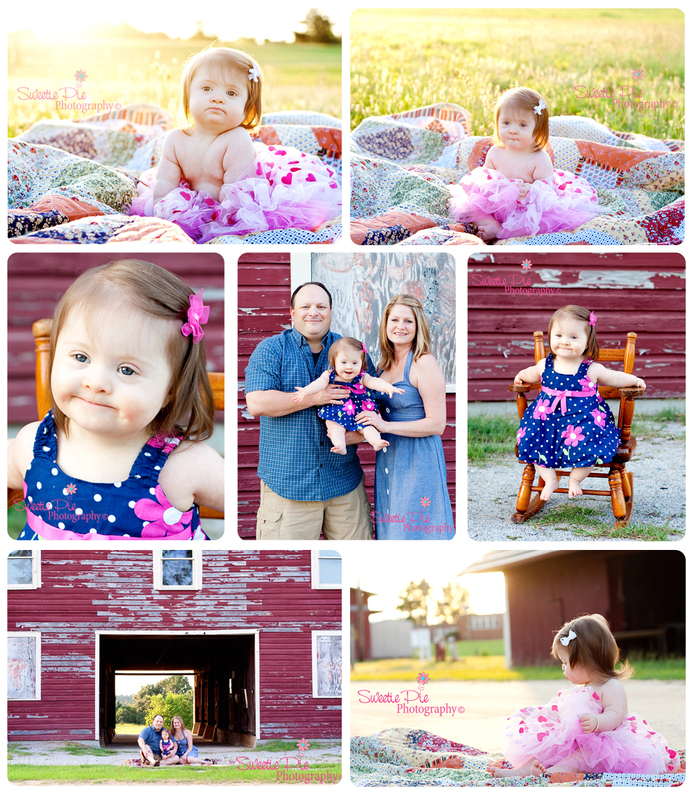 It was such a pleasure and honor to spend the evening capturing this wonderful family! I hope to see you all again soon! Over the last few weeks I received several messages from friends, acquaintances and fans of my Facebook Page asking for advice about taking day to day pictures of their families. There are a bevy of wonderful beginner photography classes. They do a fabulous job of explaining the basics of photography including the trifecta of ISO, shutter speed and aperture. Anytime someone is interested in learning more about photography, I suggest one of these classes as a first stop. Local universities and technical schools offer them and sometimes you can find classes offered by local photographers with witty titles like "Mamarazzi class". While I feel I will always have more to learn about photography, I thought I could at least answer some of the popular questions I get. I also opened it up to my fans on Facebook and have added their questions to the list. 1. What kind of camera do you use? I use a dslr (digital single lens reflex). My brand preference is Canon, but it's mostly because it's what is familiar to me. Typically a camera is a point and shoot or dslr. The easiest way to tell the difference is if the camera can change lenses. If it can it's a dslr (with the exception of a few newer top of the line P&S cameras). 2. How long have you been taking pictures? Since my mom first handed me our old family Kodak P&S and told me to have fun. Granted, I wasn't studying the technicalities of photography at the time, I think picking up a camera early certainly helps a child gain perspective and vision for imagery though. My husband is an art school graduate and is actually the reason I began a deeper study of photography. Whether it was assisting him or through his encouragement, over the last 10 years, I stepped deeper and deeper into the art form. First through film and later through digital. 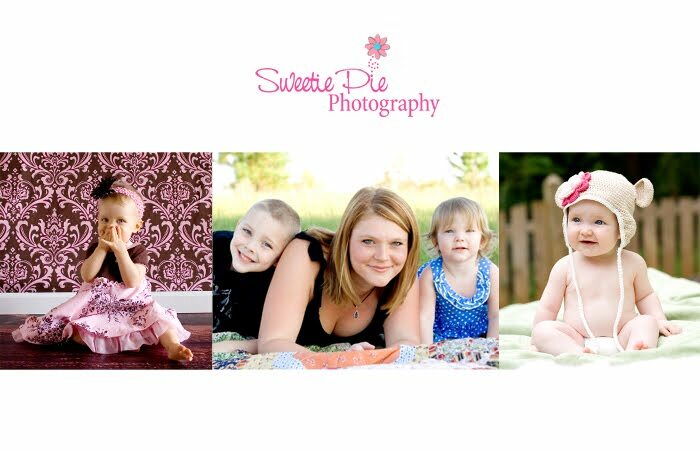 I began offering services through Sweetie Pie Photography in early 2011, but had been toying and studying well before then. 3. What is a great camera to buy that catches the moments quickly (no shutter delay)? This is a more complicated question than it first appears. I'm not sure if it's shutter speed or reset delay that's really in question here. On a dslr you can manually adjust your shutter speed to whatever you want. You are somewhat limited by the capabilities of a lens which is why it's important to be picky when choosing a lens. On a P&S, you can use different preset settings. The action setting will usually offer the highest shutter speed, but I don't believe you can actually set a specific shutter speed. What I really think this question is about is reset though. The time it takes for the camera to be ready to take another picture after it has already taken one. And there are a lot of factors at work with this. The type of memory card a camera uses will impact this because some save faster than others. My experience is that a camera which uses a CF card will reset considerably faster than one that uses an SD card. ~ Turn off the flash every time you can. It zaps the battery and takes a while to reset and when you use it, the camera will usually not take a picture until the flash is recharged. ~ Turn off the preview on the back of the camera. After you take a picture, your camera runs it through a digital darkroom in camera, converts it to jpg, adjusts contrast, saturation, levels and a good many other things. Then it offers you a preview on your screen for a certain amount of time. Considering all that's being done, it's light speed. But that preview can shave off some time that it would take for the camera to reset. ~ Prefocus on your subject by pressing your shutter button halfway down. If your subject isn't likely to move much within the frame you can go ahead and get the camera to focus. This will save it time doing so when it comes time to snap the picture. I don't have a really wide knowledge of the point and shoot cameras currently on the market. I have heard great things about both the Canon Powershot and Nikon Coolpix though. 3. How many mega pixels do I need? In many things, the thought is that more is better, but the simple truth is that it's not always the case. If your camera is a cropped sensor (if it costs less than $2000, it's a cropped sensor), then anything over 12 or so mega pixels actually may result in degraded quality of your images. A sensor is only so large and can only handle so much info before it starts to have issues. These issues usually manifest as noise (the little gray/black dots and color splotches you see when you zoom in and sometimes when you don't. They usually gather in the shadows first). I don't think there's a camera on the market currently that would have too few mega pixels for the average consumer who wants to print high resolution images 11x14 or smaller. If you want to print jumbo prints/posters, there are ways to do that effectively, even with an image taken at 8 megapixels. 4. Do you take photos in auto or manual mode for your everyday photos? Manual. For our P&S crowd, this is an slr question. When I first started with the slr, I used auto. I thought it would help me learn how to do things. But really it ended up doing things to my photos I didn't necessarily want it to do. Like, it chose a slow shutter speed because of light, but I would have rather it widened my aperture because now my 3 year old is a total blur. From there, with the encouragement of my hubby I moved to aperture priority and shutter speed priority modes depending on my needs. In aperture priority, you pick the ISO and aperture (how wide open your lens goes) and in shutter speed priority, you pic your ISO and shutter speed. The camera adjusts the remaining setting depending on the light and what you've set the other settings at. There can be problems with these modes... For example, sometimes it makes those adjustments based on light meter readings you don't really want to use. Like the shade of a tree next to your subject rather than the light of their face so you end up with an overexposed subject. 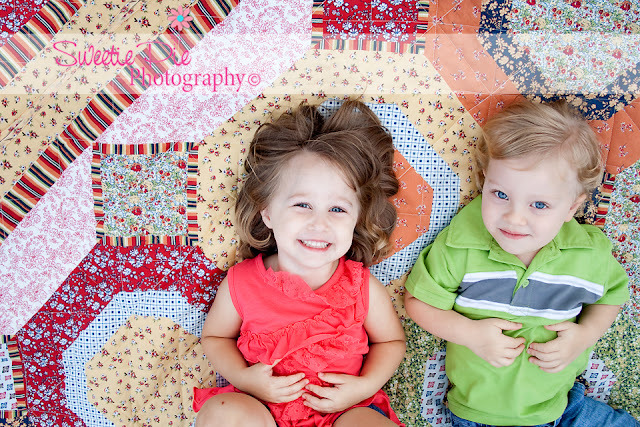 I'm a control freak and that extends into my pictures of my children. I set my ISO at a setting I feel will handle the situation, consider the depth of field I want/need (if there are a lot of people like at a family gathering I often set it a little higher if I am looking to just take documentary style photos for scrapping or sharing) and then I adjust my shutter speed within a range to ensure I don't get motion blur. If I find my exposure is off, my first preference is to adjust my ISO accordingly. If I can't or am unwilling to do that, then I will adjust the other two in a way to offset for as much as I can. It's a balancing act and it can take a while to get used to. When I shot film, I was taught to use a notebook to keep track of the settings I used for each frame. Now with digital, each image stores meta data. The best thing you can do is go out, find a scene which won't suddenly change on you and just play with your settings. Shoot a series of photos at different stops. When you get home, look back at those images on your computer and see what you like most, what looks best exposed and note the settings. Trial and error is the easiest way to get comfortable with shooting manual. Now I can adjust my settings without looking and in a nanosecond. 5. How do I get my background blurry? I remember the first time I asked this question myself and the amazingly talented and patient photographer who, bless her heart, took the time to teach me. Thank you, Nena. The blurred background which is often present in portrait photography is achieved by using a wide aperture (lower number). Doing this narrows the depth of field which is the portion of the image which is in focus. You can increase this effect by putting greater distance between your subject and the background. It can only be achieved when you have the ability to adjust the aperture of your camera. I don't believe P&S cameras come with this ability, but I could be wrong. With slr cameras, your ability to do this is determined by the limitations of your lens. You can also do this in post, but it can be a little harder to achieve a natural look to it and it can be time consuming. 6. Is there really any difference between printers? and it's close cousin: Where should I get my photos printed? You have only to google print lab comparisons to come up with some stellar examples of just how big a difference there is between labs and printers. My personal and professional experience is that home printers tend to over saturate an image and often you'll find odd color casts. So skin will appear orange or odd where really it's not in the image file if you view it on your screen. These same issues often occur with the labs of mass discount retailers such as Walmart and Target. One really sad effect I often see is dark shadows where in the original file there really are none. They often occur in the eyes and can make a photo where a child or person's eyes are clearly visible and beautiful in the file, hardly distinguishable and cast in muddy shadow. One of my favorite quotes is "The eyes are the window to the soul". It's been attributed to too many people for me to know the true source. But when I see prints where eyes are so dark and muddy it breaks my heart because they're such an important feature of a person. Without exception, your photographer's professional lab is going to deliver prints which are above and beyond the quality of a consumer printer. The closest to professional quality I've seen and heard of is www.mpix.com. Mpix is a consumer division of one of my favorite pro labs. The quality is still not equal to a pro lab as it's not cost effective for them to calibrate their equipment as often, but it's leaps and bounds better than Walmart, Target, Walgreens, Shutterfly or any other consumer printer I've seen and their prices actually are usually cheaper than Walmart. So I would definitely suggest checking them out! 7. Should I get a dslr or a point and shoot camera? I answer this question with a question of my own: Do you want to take the time to learn how to shoot in a mode other than automatic? Dealing with the hassle of settings isn't for everyone, but spending money on a dslr (and you have to tack on the costs of lenses which often cost well more than the camera itself... for the good glass) is really pointless if you're not going to take the time to learn about the camera and how to shoot off auto. If you're fine with staying in auto, then really any nice point and shoot should serve you nicely and you've managed to save a good bit of money in the process that you can spend taking the family on a trip to practice your photography skills. 8. How can I make my photos stand out? Google photography composition. There's a wealth of information out there. When you see a photo that speaks to you, stop and question why. There are guidelines photographers follow, such as the rule of thirds which suggests breaking an image into thirds both horizontally and vertically and then placing your subject at one of the 4 outer intersections will make for a more powerful photo. When you take a photo, don't place your subject in the dead center. Then you end up with 1/2 a photo of nothing (the dead space above the head). Take leading lines into consideration. People are drawn to patterns and we have a natural compulsion to follow lines. Using natural lines either created by your subject or background will draw a viewer into a photo and make it naturally more compelling. Use white space and use it well. My degree is in advertising and we used to discuss how vital white space can be in an ad. Sometimes a solitary subject can be much more compelling than one stuck in the middle of random stuff. 9. What do you use to edit your photos? I process my photos through ACR Raw and Photoshop. Many pros also use a program called Lightroom. But there's a caveat with all 3 of those... We use those programs to help us make a living. It's a job. One we may love and enjoy, but a job. Taking family snapshots is not supposed to be a job. It's supposed to be enjoyable. All cameras will take and save images as jpg files. These files have been processed in camera with adjustments being made to contrast, saturation, levels and all sorts of other things. This is done purposefully so you don't have to spend time messing with them in a computer program. If you absolutely must have a program to toy with photos, I usually suggest Photoshop Express. It's considerably cheaper than Photoshop, will perform practically all of the functions you need for day to day photography and will be leaps and bounds easier to get started in. If you want to see what it can do or if you have it and want to learn more about how to work in it, I suggest going to You Tube and searching "Photoshop Express". It's amazing all of the free tutorials you can find! 10. What is this RAW file thing and why are they so big? If you have a dslr camera, you have the option of saving your images as raw files. Usually you can save a raw version, a raw version and jpg version or just a jpg version. Raw files have not been processed in the camera. When the camera processes an image to make a jpg file, it makes adjustments and then compresses the file, booting the information from the image which is no longer necessary. Raw files have every piece of information originally there. As a result, image exposure and white balance can be adjusted a little more easily in post using a program called ACR or Adobe Camera Raw. This is very beneficial for professional photographers who may need to be able to make tweaks. However all of that info also means they are very large and cumbersome files. So you won't get nearly as many of them as jpg files on a memory card and they'll eat up hard drive space on your computer. Secondly, when you shoot jpg, you can pull your disk out, take it somewhere and print your photos. No other processing needed. However, printers will not accept raw files, so you have to convert them to jpgs before they can be printed. If you've been taking pictures of Uncle Bobby's birthday party and you have 150 or so, you're looking at a lot of images to convert. Thirdly, not only do the files need converting for printing, but they need processing. What you have is a digital negative. It hasn't had any of those contrast, saturation and other adjustments. Raw negatives are typically fairly grey looking and lack any real punch as far as color goes. So before you convert them to jpgs, you need to process them using a program such as the ones discussed in #9. But again, that could be a lot of work for little reason. I shoot raw because clients are paying me to do the absolute best I can do, not the best my camera can do. That means I have to maintain control. So I shoot in manual to ensure my exposure and speed are on point and then I shoot raw to ensure that when the image is adjusted for contrast, saturation and various other adjustments, it's done so in a way that most effectively works for the photo rather than in a way the camera has been set up to operate, which may not be the very best way 100% of the time. I really hope these questions and answers have helped. My goal is that they get you out there photographing your family and children more. When we had our oldest daughter, my husband would tease me about how many pictures I took. At times he would get flustered and ask me to put down the camera. But it didn't take long for the changes in her to become apparent and now he's very grateful for the photos we have. It's important though to not just take them and post them to Facebook, but to print them for yourselves. Each of our children have photo displays on their walls which have them and other loved ones in them. It won't be long until their grown and in typical adult fashion hate seeing their own photos, but I try to encourage their current adoration of seeing a photo of themselves. It's so precious to see how excited they get. Always remember to share the camera with other family members and be sure to get in some of those pictures yourself. It's a shame to have a family album with one of the most important family member's in your child's life missing. Remember that pictures of you are not for you, they're for them. Feel free to email or message me any photography related questions you have. I'm happy to share and if I get enough, I'll do another blog post. I love all of my clients and I'll admit that I have baby/child vision. I haven't met a child yet that I don't think is beautiful, but this little girl was beyond the norm. 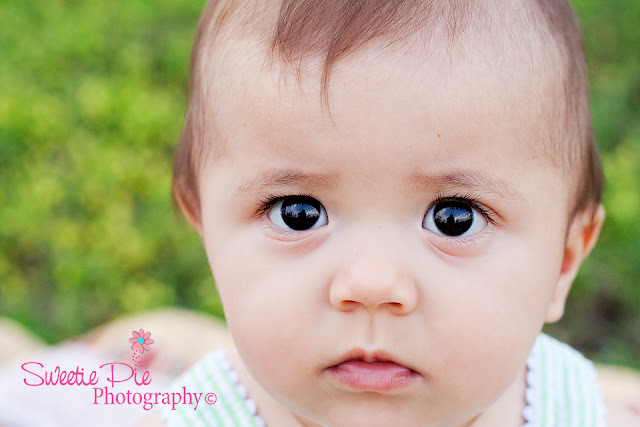 A couple of months ago I photographed her adorable cousin. It's obvious that beauty and sweetness run in the family. After an hour with this baby doll, I wanted to pack her up and take her home with me! But it's obvious her family love and adore her so I settled for a hug and wave goodbye. I can't wait to get to see her again. Next time I'll be sure to bring a larger selection of tutus as we discovered she is quite fond of them! If you enjoy these images and would like to see more of my work, please feel free to visit and like my Facebook Page. May is the month for Mommies. Mom's do so much for their children whether still tots or grown with their own babes, it's only fitting that a day be set aside to celebrate all that they do. One of the biggest jobs moms have is capturing and documenting the growth and development of their children with photographs. This often means mom herself is not in those photos which seems awfully sad since she's such a big part of her child's life. 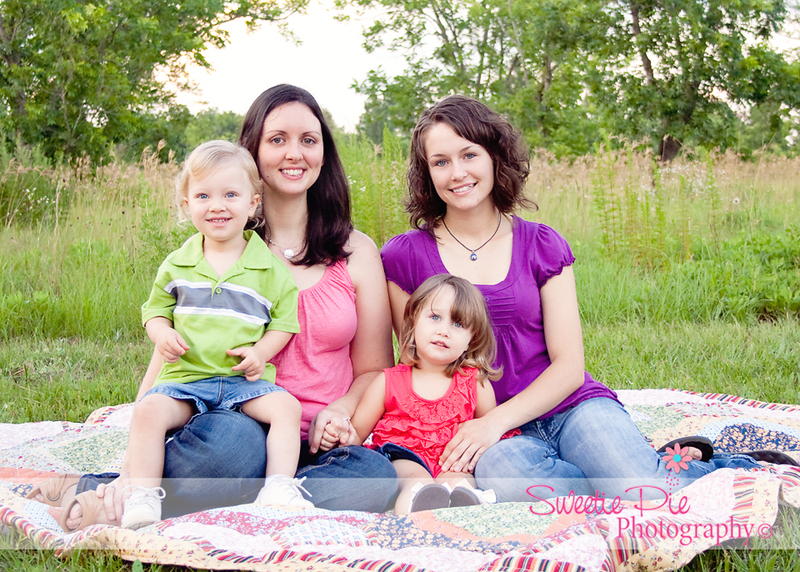 That's one of the reasons I am offering Mommy Moment Mini-Sessions. For those who don't know about mini sessions, they're a shorter, less expensive session that aims to capture a particular moment or theme. These also include a 5x7 print, Facebook timeline cover and discounts towards additional products and prints. The goal is for mom to walkaway with some timeless photographs of her and her child(ren) which celebrate how much she loves and how loved she is in return. While mini sessions often are held on a particular day, these sessions are flexible and will be scheduled with mom's at their convenience. The only stipulation is that they should occur within 60 days of purchase. 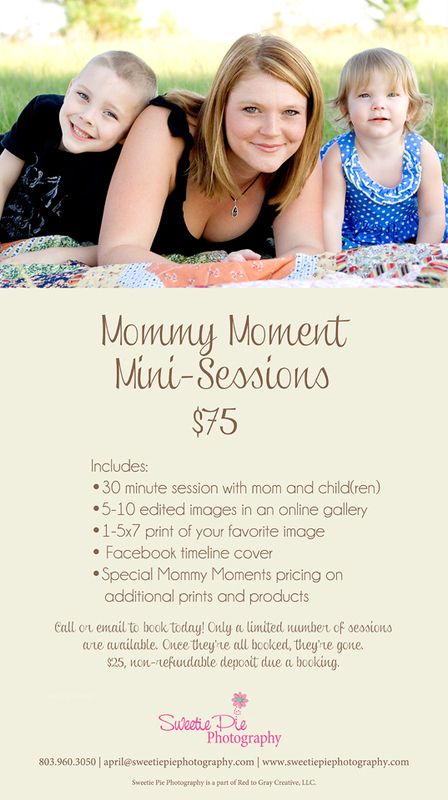 So one of these sessions would make a fantastic Mother's day present for a special mom! To book or for more info, call (803.960.3050) or email me today! I recently was delighted to meet up with the very sweet "H" family in order to do their family portrait and also capture their angel's six month milestone. You may recognize her from her newborn session which was posted this past fall although it feels like it was just yesterday. On this occasion she was much more awake and it was great fun to interact with her, watch her smile and work to capture that blossoming personality of hers. She's going to be quite the stunner! Here are a few of my favorite images from our time together. 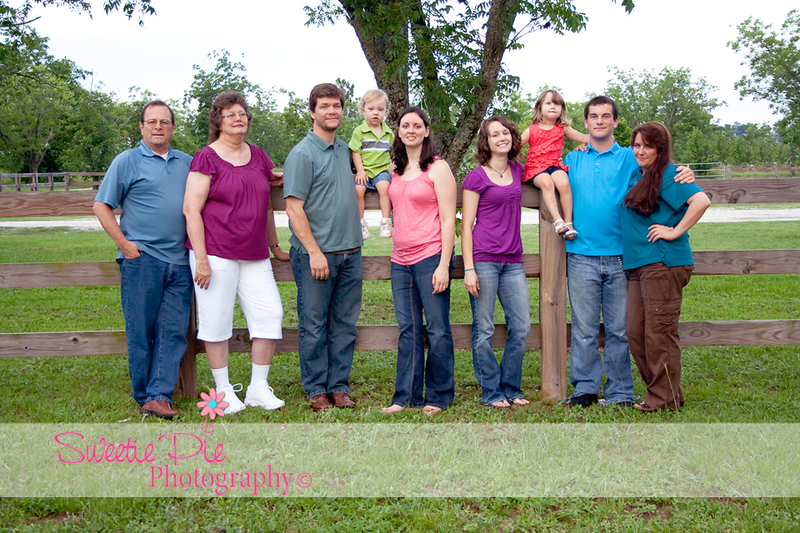 Thank you, "H" family for allowing me the pleasure of capturing your precious family and this special time. I can't wait to see you guys again and watch as Miss B grows! 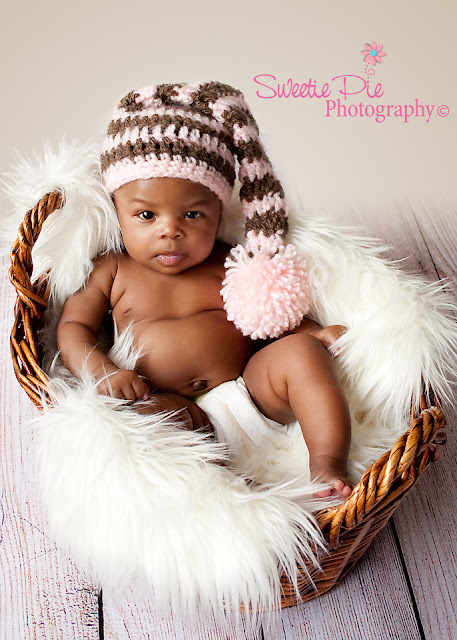 I recently was blessed with the opportunity to photograph the sweetest little 3 month angel. She was such a little pro! I have had a string of really amazing little posers it seems and she was certainly one of them. Her proud mommy and daddy came with a couple of wardrobe changes and we tossed in some props I had on hand. The pink and brown hat courtesy of LAD-zigns seemed made for her! Her mom seemed to agree so we had to get a canvas of her in it. Sweet! 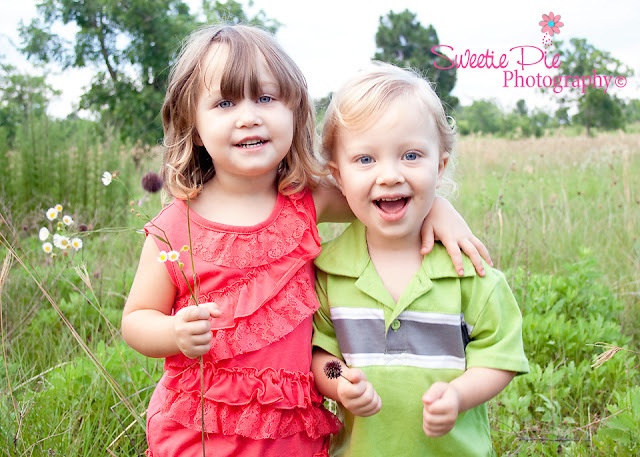 She was such a pro that our session flew by quickly and we ended up with plenty of sweet captures! Here are a couple of my favorites! Hope you enjoy the captures, Mom and Dad. I look forward to seeing Miss K again soon! 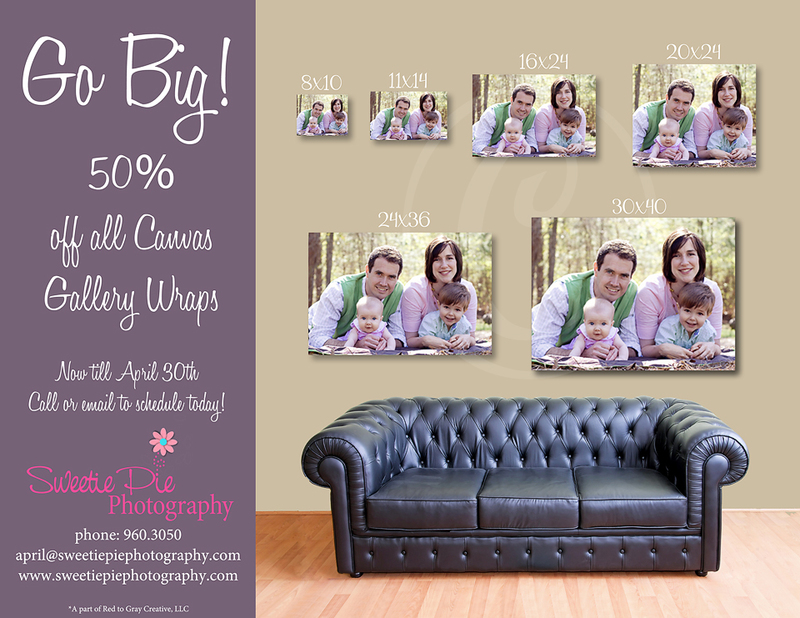 Gift prints sized 5x7 are great for putting in an album, but nothing looks fabulous on the wall like a Gallery Wrapped Canvas and during the month of April we're making it much easier for you to Go Big because we're offering them for 50% off! Call or email us today to schedule!